Shimano Ultegra FB Fishing reel is one of the Shimano mid-range reels. 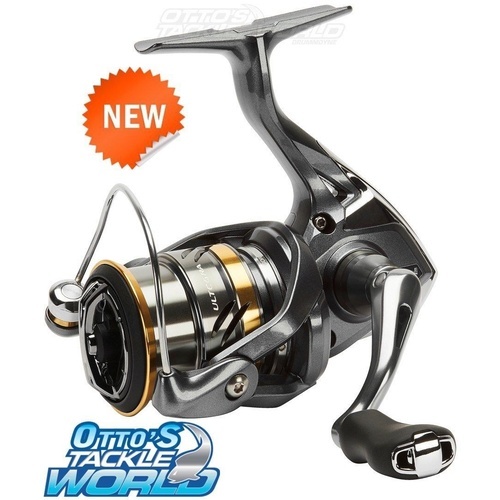 Shimano Ultegra FB spinning reel comes in 5 different sizes cover a wide range of freshwater and saltwater application. Shimano Ultegra FB packed full of Shimano latest technology such as XGT-7 Body, Hagane Gear, X-Ship, SA-RB, Core Protect and G Free Body. The Ultegra FB has been proven to be an economic choice among anglers. Shimano Ultegra FB starts with the 1000 size all the way to 5000 sizes. Shimano Ultegra FB house inside the XGT-7 body of the Ultegra FB series sits the Hagane Gear, working in conjunction with X-Ship to provide robust gear engagement. 5+1 SA-RB bearings feature in all models of the Ultegra FB, and the drag output ranges from 3-11kg depending on the model. Core Protect provides vital saltwater resistance, while G Free Body shifts the reel’s center of gravity closer to the rod, enhancing angler comfort. G Free Body - G Free Body technology has been developed to shift the reel’s center of gravity closer to the rod. This has been achieved by moving the worm shaft oscillation mechanism 19mm up from the bottom of the reel to the top. By moving the center of gravity closer to the angler’s hand position, the G Free Body helps to reduce fatigue and enhances casting comfort. Hagane Gear - Hagane is the concept of power. By using a cold forging technique, we produced a class-leading drive gear that is stronger and more durable. AR- C Spool - Through tens of thousands of casting tests and computer simulations, it has been determined that the AR-C spool lip design produces longer casting distances than a standard spool lip while preventing backlashes and wind knots from forming. It also allows the line to flow off the spool in smaller loops during the cast, which means less slap on the stripper guide. This results in longer casts with less friction. A spool designed with a V-shape spool lip ensures the line comes off the reel in smaller loops, for longer, more accurate casting. CoreProtect - The concept of CoreProtect is simple... to provide water resistance without creating a heavy rotation feeling. There are three key areas of the reel that require protection: the roller clutch, the body, and the line roller. One-Piece Bail - One-Piece Bail allows the line to travel unimpeded to the line roller. Its seamless design reduces friction and the chance of tangles or cuts to the bail arm.